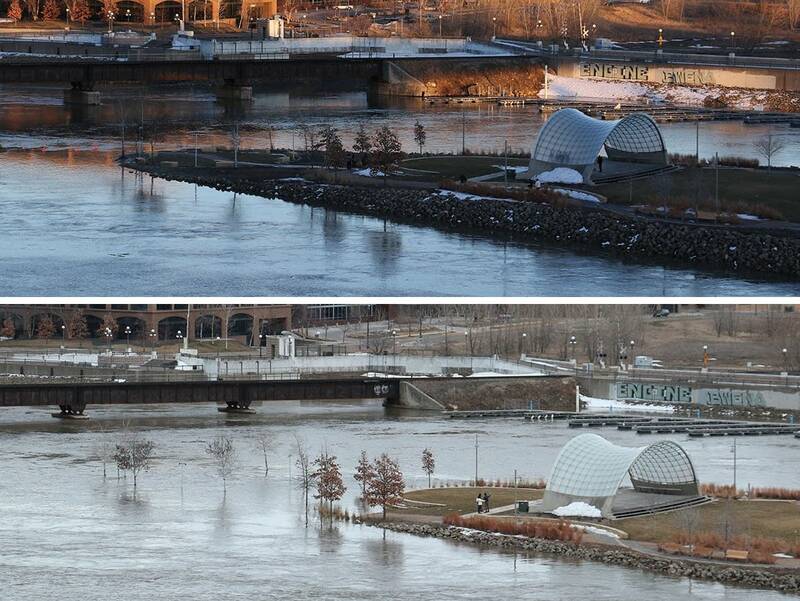 Ice jams caused flash flooding along some Minnesota rivers over the weekend, while sandbagging efforts continued along others as water levels kept rising. More than 40 people were evacuated from a riverside restaurant near St. Cloud on Saturday night after a flash flood along the Sauk River — a flood apparently caused by an ice jam, one of many along Minnesota waterways in the past couple weeks. The St. Cloud Times reported several fire departments used boats to evacuate diners from Anton's Restaurant in Waite Park after the flooding started at about 7:30 p.m.
"People's first reaction was, 'Oh my gosh, is this just going to be a quick surge of water and it's going to go right back out?' When we realized it wasn't, people were trying to get to their cars and get them out of water in the parking lot," Patty Gaetz, who is married to one of the restaurant's owners, told MPR News. "We are so fortunate — everyone was very calm, it was organized, and that includes customers and our staff." Waite Park Fire Chief Jim Aleshire said his department requested mutual aid from St. Joseph and St. Cloud. First responders used three boats and were able to get everyone safely out of the restaurant by about 9:30 p.m.
Gaetz said there have been floods at the restaurant in the past, but they've never been caught in a flash flood without warning. She said the flood waters fully receded after a couple hours. They're hoping, if all goes well, to finish repairs and open up again by next weekend. The National Weather Service issued a flash flood warning for the Delano area on Friday night after an ice jam at the Bridge Avenue bridge caused the Crow River to rise a few feet. City officials reported later in the evening that public works crews "successfully removed the ice and debris near the bridge and the river levels are slowly decreasing. Crews will continue to watch the levels throughout the night and weekend." Ice jams also reportedly caused a spike in the level of the Redwood River near Redwood Falls on Saturday. And earlier this month, an ice jam along Sand Creek flooded a neighborhood in Jordan, southwest of the Twin Cities. MPR News reporters are working across the state, talking to Minnesota officials and citizens about how they're dealing with the unpredictable weather and preparing for possible floods. Here's what we're seeing as the week begins. • Tell MPR News: How are you preparing for flood season? Minnesota Gov. Tim Walz, Lt. Gov. Peggy Flanagan and U.S. Rep. Angie Craig were among the public officials who joined Hastings residents to fill thousands of sandbags on Saturday morning. The Mississippi River at Hastings is forecast to continue rising to major flood stage over the coming week, possibly affecting flood-prone areas on the eastern side of the city. But there have been some encouraging signs, too. There's little rain in the forecast — and the past week has seen a number of below-freezing nights that help slow the snowmelt and the rising water levels. "I look now, I find myself saying, it's 28 degrees at night and I'm cheering, knowing that we're — so far — getting a pretty good melt on this," Walz told reporters on Friday. "But we recognize that there will be localized flooding — that's the best-case scenario. Worst-case scenario, of course, is that it'll be much more widespread. We are preparing for both of those." Sandbagging also continued over the weekend along the St. Croix River in Stillwater. The city of Moorhead will start asking for volunteer help this week to fill sandbags in anticipation of spring flooding along the Red River. Moorhead Mayor Jonathan Judd said he doesn't expect any problems getting enough volunteers to do the work. "Our amazing Moorhead student bodies, from the colleges down to the high school, have already expressed a willingness to help," he said. "We have so many churches, organizations and individuals who are also willing to come out and serve our city." Moorhead will fill about 150,000 sandbags to prepare for a worst-case flood scenario under the current National Weather Service flood outlook. During a record flood in 2009, Moorhead used about 2.5 million sandbags to protect homes along the Red River. The city has since removed dozens of flood-prone homes and built miles of permanent levees. Across the river in Fargo, volunteers will start the work of filling a million sandbags in anticipation of high water. The city uses machines called spiders, which send sand down metal tubes into sandbags held by volunteers. Fargo Mayor Tim Mahoney said the city will need a lot of volunteers. "When we're running Sandbag Central full blast, we need 200 volunteers an hour," he said. "(It) takes about 80 to 100 to run each spider. We anticipate that if we have both spiders running we can make about 100,000 sandbags a day." City officials don't yet know if they will need a million sandbags, but Mahoney said they need to prepare for a worst-case scenario. Fargo also has taken steps in recent years to remove homes from flood zones and add additional flood protection. A round of road closures was set to take effect late Sunday along some streets near the rising Mississippi River in St. Paul. The main roads affected are Shepard and Warner roads. With the closures in place there will be no access to or from downtown using Warner Road to the east. Coming from the west on Shepard Road, drivers have to exit at Eagle Parkway. Some ancillary streets — including portions of Sibley and Jackson streets — also are closed. Meanwhile, in Burnsville, the Interstate 35W northbound ramps at Black Dog Road were set to close Sunday night because of high water on the Minnesota River. To the southwest, some state highways remained closed Sunday due to flooding in the Minnesota River valley between the Twin Cities and Mankato. Marshall, Minn., Mayor Bob Byrnes declared a state of emergency in the city on Sunday, in response to record water levels along the Redwood River. "City leadership and staff have been performing continuous monitoring of the Redwood River and street storm water systems. Currently the river is experiencing moderate to high flows with ice dams," the declaration read. "River structures and street storm water systems are currently taking the flows, however, the city's Public Works Division has utilized pumps in certain locations to alleviate localized urban flooding." According to the National Weather Service, the level of the Redwood River at Marshall dropped a bit to just under 17 feet as of Sunday night, but was forecast to rise above 18 feet in the coming days. The previous record level at that gauge was 17.4 feet, set just last summer.